SO that wonderful day dedicated to all things love related is fast approaching: Valentine’s Day. What do you have planned for the special day? Roses? Chocolates? Dinner with your honey bunny? Or maybe you’re single. And happy. Maybe you hate all the consumerism and hallmark sentimentality that comes with Valentine’s Day. Maybe all you want to cuddle up with that weekend is a really good book. Well, if that’s the case, I have just the thing for you. Why not pick up some great horror and dark fantasy novels to celebrate Valentine’s day? It still involves matters of the heart, just more the possibility of one getting ripped out. The Valentine’s Day “EAT YOUR HEART OUT” Author Extravaganza will feature a huge array of great horror and dark fantasy fiction all on a special 99 cent sale for the e-book versions. 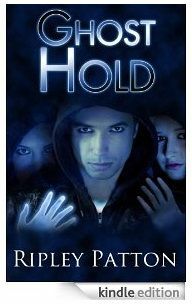 And I’m thrilled to say that GHOST HOLD will be one of the books on offer for that special love-you-darkly price. Be sure to join the event on FACEBOOK and invite your friends too. On the day there will be authors galore, giveaways, contests, and prizes guaranteed to make your heart quiver.